The kids usually will take a lot of toys or other things,these are scattered holding and inconvenient, while this beach mesh bag can put them all together and miss all the sand,water in the same time. Even you can use it to storage the snow tools in winter. With this toy storage bag, kids will be interesting in carry the toys by themselves. Also it can be used as a laundry tote, toy storage at home to put all kid’s toys and hang it on the wall. When not in use, this sand away beach bag can be folded back into it’s pocket for easy storage. It can be used as a laundry tote, toy storage at home to put all kid’s toys and hang it on the wall or for carrying dresses, towels, toys to the beach in summer, and storage the snow tools in winter. The toy storage bag can be wrapped up and stores away nice and compact inside its pouch that can be closed with a clasp for easy storage when not in use. The wrist strap is also attached to this pouch making it nice and portable. 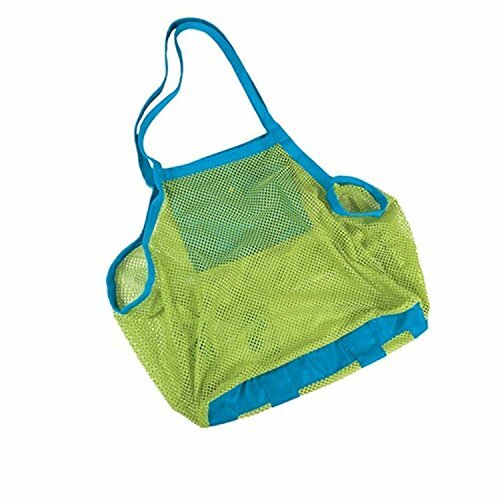 The sand away bag is made of a durable and high quality see-thru nylon mesh where you always be able to see what you are carrying without having to look inside. It has very deep and wide space in it so it can withhold lot of toys or dresses. Easy to wash and dry.